The 30 Days of Biking challenge asks people to pledge to ride their bikes every day in April. For someone who doesn’t have an existing bike-riding habit this represents a major commitment and a new way of life. For an old hand like me—Bike to Work Barb!—no biggie, right? Well, maybe the fact that this challenge starts on April Fool’s Day has something to do with it, but here’s my story for Day One. First challenge: On a day that dawned sunny and beautiful I couldn’t ride my bike to work. I needed to leave with my sweetheart straight from work for a family voyage so I rode the bus to work. I had thought in advance about how I could get in a ride, no matter how brief, and I had my plan. Thanks to the City of Spokane we have a loaner bike at work for check-out and I had a hair appointment less than a half-mile away. Perfect solution! I normally find these shoes pretty comfortable for running around, but by the time I needed to leave I had realized the new shoes I wore yesterday created some sore points that these shoes rubbed as well, so I had some hot spots developing. My salon had called to see if I wanted an earlier appointment and I was scrambling to try to make that work, which created a sense of time pressure I don’t usually feel when using a bike for transportation. A construction project has the campus streets torn up pretty thoroughly. 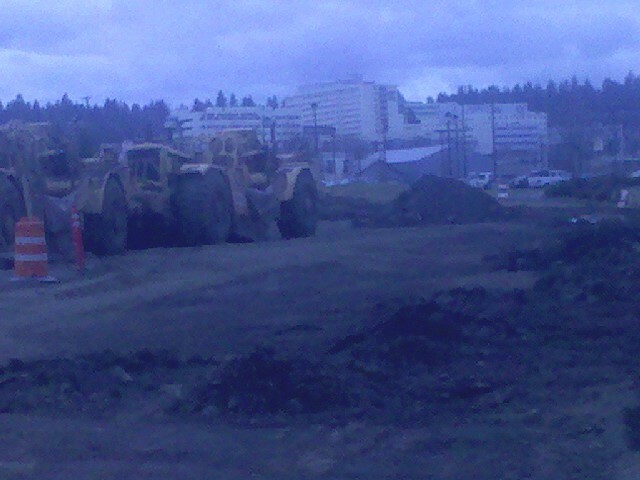 As I teetered at the edge of the dirt pit a construction worker waved me toward one of my two options for crossing the street. 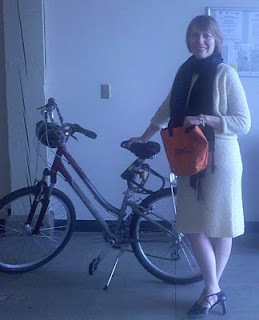 I headed west, then south, then east, trying to reach the Transportation Services office to get the bike. One little snag: You can’t get there from here. I picked my way through a parking lot only to discover that the construction had me cut off on the east, so back I went the way I came. By this time my dogs were barking, to say nothing of the way this was chewing up the clock. When I got back to the grassy, un-torn-up part of campus I pulled my shoes off and ran barefoot across the lawn for a little foot freedom. Then I wiped off my feet, put the by-now-really-ouchy shoes back on, and hiked through the construction zone and another parking lot. Luckily the nice folks in Transportation Services had some bandages so I could buffer my blisters a bit. The loaner bike has both a cable and a U-lock. It took me a little bit of effort to get that all coiled up and attached in a way that kept the U-lock up where it wouldn’t fall into the spokes and jam me up, but finally I was off. I set off on the loaner bike back through the construction and around through campus. 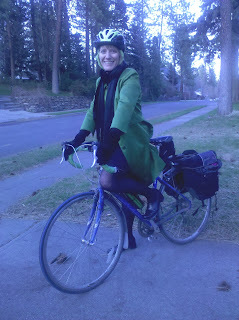 I hadn’t bothered to adjust the seat, so my pedaling form would have reminded you of the scene in the Wizard of Oz with the mean old neighbor lady pedaling like mad. The rain had started coming down too, proving to my satisfaction that the Wicked Witch of the West theme music playing in my head didn’t really apply since I wasn’t melting. After a few blocks I stopped to adjust the seat, which took a few minutes because I loosened the wrong attachment, then figured out what I needed to do and raised the seat. I got on to pedal away and promptly sank downward—in messing with the mechanism I had managed to rotate the handle a couple of times and had loosened the nut on the other side [insert your own joke here]. Back off the bike. Tighten the attachment. Raise the seat and finish the adjustment. Get back on and ride, much happier now that I at least had a decent seat height although the bike size really doesn’t match me and I felt like a Shriner on a toy bike. While our loaner bike has a rack it doesn’t have panniers so I didn't have my usual handy-dandy way to carry stuff. I carried my cell phone and wallet in a little bag, alternately dangling it from my wrist, my shoulder, and the handlebars. On the plus side, this bike has a step-through frame; my usual bike is a road bike and the straddle involves more flashing of bystanders. I also enjoyed the more upright posture; I may just have to start scouting around for something along these lines despite the increased resemblance to Almira Gulch that entails. The rain kept sprinkling—more than sprinkling, really, but not bad and spring rain just doesn’t seem as cold and bone-chilling as winter rain. I couldn’t really appreciate this difference until I started riding in all kinds of weather and paying more attention to my surroundings and the change of seasons. I made it downtown, locked up the bike, got the quick hair trim I needed before heading out of town next week on a business trip, headed back, and did the whole construction zone-parking lot dance in reverse. Compared to my usual easy-squeezy biking—get on bike, ride to work, park in rack next to my building, ride home—this represented a lot more effort, and probably a lot more entertainment value for anyone watching any portion. But I got my 30 days of biking started. Now to figure out what I do for bike access five days next week when I travel to Washington, D.C., without paying an arm and a leg for rental. Does the hotel exercise bike count?